Gravity Racking comes form selective pallet racking. It’s suitable for storage lots of the same cargo, the storage density is very high. It has first in first out loading rule. The depth and height can be customized. Gravity Racking is also called roller racking. 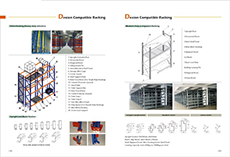 The structure is similar with standard pallet racking. It have roller system on the beam with 3 – 5 degree angel. Pallet was loaded into racking by forklift, then slide into the other side under help of gravity. 1. Cargo load into racking system from one side then slide to the other side. There is stopper to control the speed. Material handing equipment could load/unload cargo easily. 2. Cargo flow according to first in first out rule, the system can be suitable for other automatically line. 3. The racking system is environment friendly, the system don’t need any powder supply. The system is with low noise and can work by full load. 4. The system is suitable for pallet loading/unloading. It’s a good solution for big pallet and only need one cargo passage. Gravity racking don’t need aisle for the system which increase the space use rate by 60%. Picking and storage function is separated, then reduce quantity of forklift and operation time. It’s mainly used for accurate material flow line like automatically assemble line. Depth of gravity racking should not be too deep, otherwise the angel will be too large then difficult to control speed. Also the pallet may be tilt. There should be cushion and picking station on the end of racking system. Damping system is required to control the speed.